Students at Dover Elementary School gathered to discuss Kelly Barnhill's novel "The Girl Who Drank the Moon." The book features paper birds, and these students made their own versions as a group activity. One sixth-grader had a question for Barnhill about those paper birds that are so prominent in the novel, which is nominated for Vermont's Dorothy Canfield Fisher Book Award and also is the latest Newbery Medal winner. Trevor Gray: "Why did you choose birds in your book instead of other animals?" Kelly Barnhill: "So I really, really like birds. When I was a little kid, I used to watch birds and draw pictures of birds. I had a little tape player, and I would get tapes from the library of bird calls. And I would listen to it over and over and over again and try to be able to pick out the calls of different birds. And birds show up in my books in all kinds of different ways. Even when I’m not meaning to put them in there, I end up accidentally writing about a bird. So those birds showed up because that is kind of my go-to place when I write fiction. "Also because making paper birds is such a cool thing to do. You take this flat piece of paper and you turn it into something three-dimensional. And then you can imagine it doing all kinds of things – flying away, pecking at the ground, or even, you know, maybe even attacking somebody. So I just really like birds. And that’s maybe not the greatest answer, but it’s the answer I got. I put in birds because I really like birds." Want to make an origami bird? Click here for the instructions these Dover students followed. 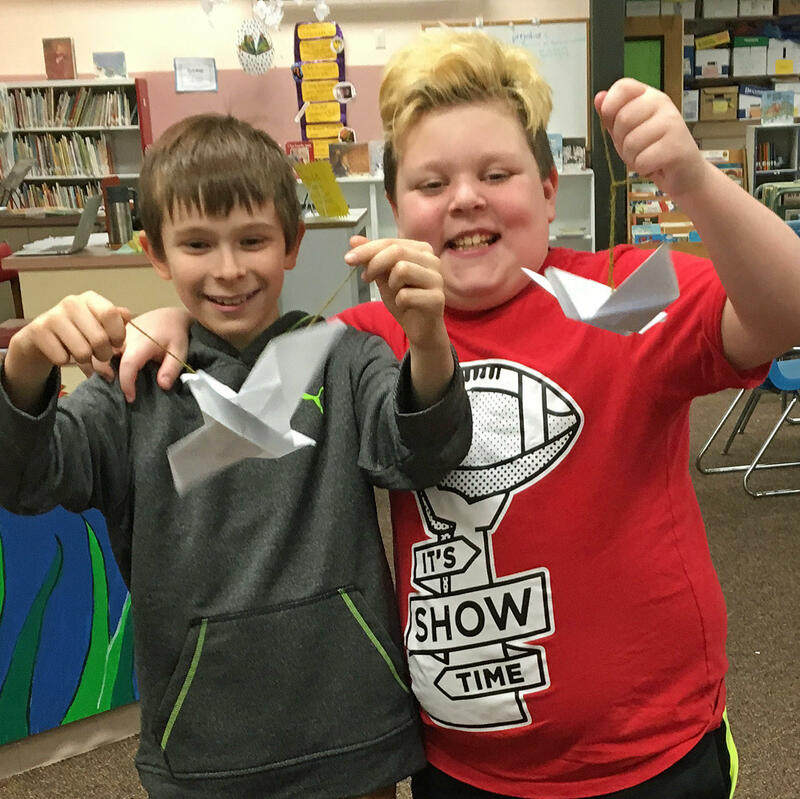 Dylan Aplin, left, and Noah DesRochers show the origami birds they made to hang in the Dover Elementary School library. The book takes place in and around the Protectorate, a sad and gloomy village where the people live in fear of a witch in the woods outside the Protectorate’s walls. Every year they offer up a sacrifice for the witch so she will leave them alone, as we learn at the very start of the book. But the reader soon learns what the people of the Protectorate don’t know. Xan, the witch in the forest, is actually good. Each year she rescues the baby that’s left in the woods as a sacrifice, and finds the child a new home in a happier place on the other side of the wood. She nourishes the children with starlight on their long journey. However one year she’s careless and accidentally feeds the child magical moonlight. So Xan brings the enmagicked girl to her home in the forest, where she lives with a poetry-reciting swamp monster and a tiny dragon. She names the baby Luna and raises her as her granddaughter. One fourth-grader wanted to know more about the characters in the book. 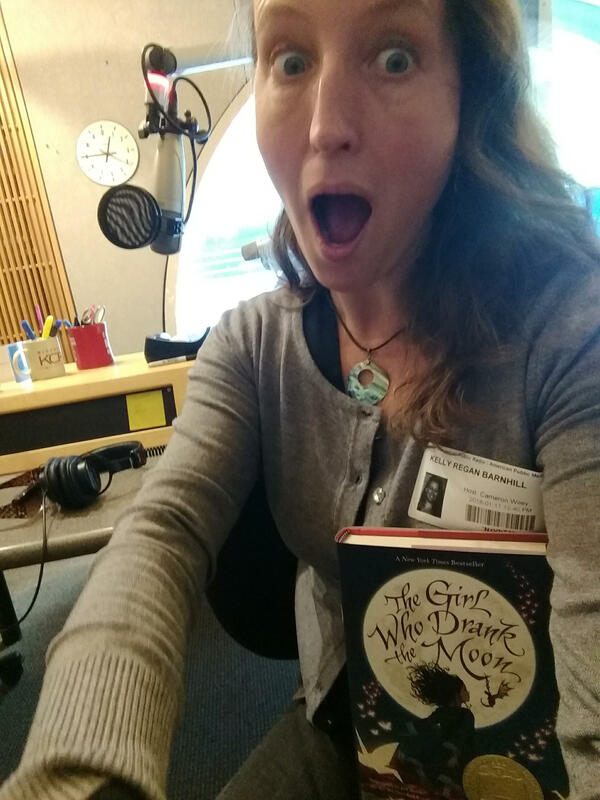 Author Kelly Barnhill snapped a selfie from Minnesota Public Radio where she went to record answers to Dover Elementary School students' questions about her novel "The Girl Who Drank the Moon." Barnhill says she doesn’t exactly pick the characters. Actually, it seems more like they pick her. Kelly Barnhill: "Well, here’s the thing. I think that writers don’t always pick the characters. The characters just sort of show up. That has certainly been my experience, that the characters just kind of show up. I do a process of getting to know the characters and learning about the characters and kind of exploring the characters. But I don’t know, I can’t really say that I actually I pick them. They just are the people who are in that story." Case-in-point is Glerk, the swamp monster, who Barnhill says was the first to come to her, while she was out for a run with her dog. Kelly Barnhill: “I had this experience before I had any kind of idea for this book, when I was out for a run. And I had this sudden image in my head of a swamp monster. And it had four arms and a tail and eyes that moved independently of each other and wide, damp jaws and it was holding a daisy in one hand and it was reciting a poem. And it was so immediate and so completely transfixing that I just stood where I was. "My poor dog was very confused [as] to why we had stopped running. And I memorized the poem that the swamp monster was saying. And I sort of ran it through my head a bunch of times. And I ran home and I wrote it down on a card. And it was actually the last poem that appears in the book. The one that goes, ‘The heart is built of starlight / And time. / A pinprick of longing lost in the dark.’ Et cetera, et cetera. And I never changed it. It appears in the book as exactly as it was in my head that particular date." 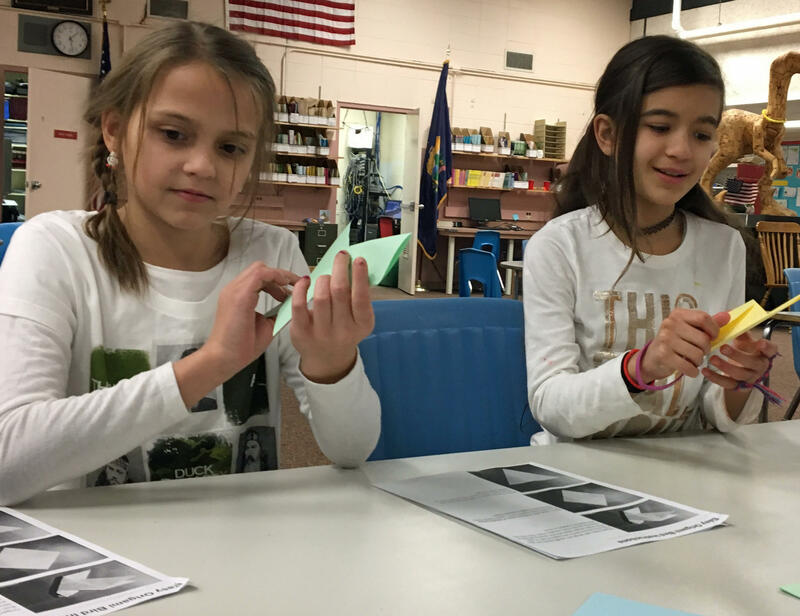 Islynn Crafts and Alejandra Bevilacqua work out how to fold paper birds, like those that play a role in Kelly Barnhill's book "The Girl Who Drank the Moon." Barnhill says she thinks about her books for a long time, and keeps boxes of little notes like Glerk’s poem. Once that process is finished, then she starts writing. And one Dover fifth-grader wondered how much time that part takes. Alanna Bevilacqua: "How long did it take you to write the book?" Kelly Barnhill: "Alanna, I’m really happy that you asked that question. Every book takes a different amount of time … But this book was my very, very shortest. The Girl Who Drank the Moon took me only five months to write. So it kind of came out all in one chunk. The book that I’m working on right now, though, I’ve been working on for four years. So every book is different." One sixth-grade student wanted to know if there would be more to read about the characters in The Girl Who Drank the Moon. Addison DeVault: "Do you think you will write a sequel to this book?" Kelly Barnhill: "I know that I will not write a sequel to this book. I have always said that I, I’m not a sequel person. I write standalone books. … Now I am working on a book right now which I think is gonna be more than one book, and so it will be the moment in which I end the 'no-sequels' rule. … That rule may be ending but for the books that are already written, none of them will have sequels. I leave it up to you, my dear, to write the sequel and I really would like to read it." 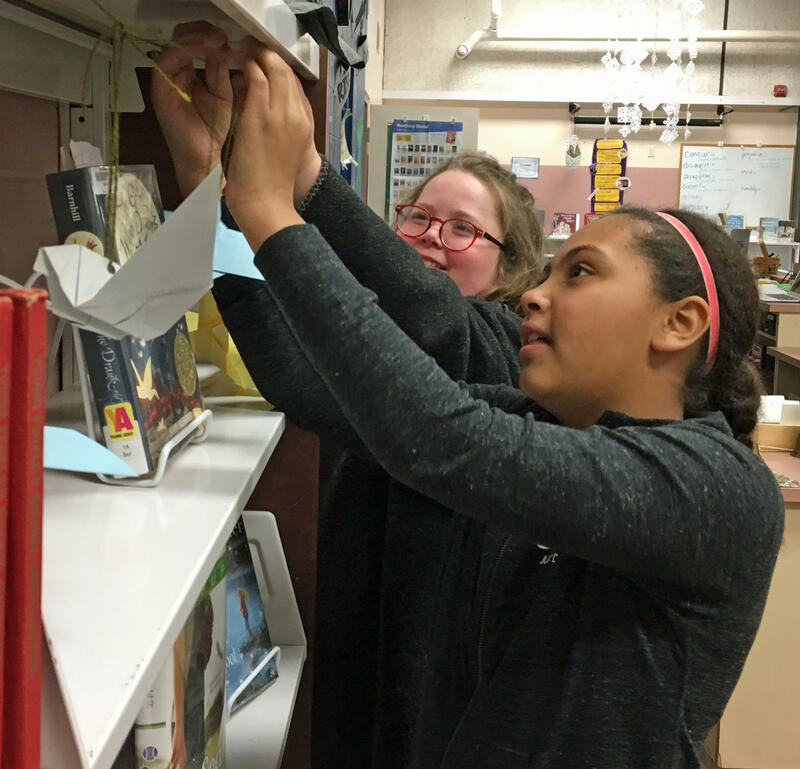 Kelsey Thayler, front, and Hadley Andrew hang their paper birds around the display of Dorothy's List books at their school library. Kaley Mola: "If you were to make a movie, how would you imagine it?" Kelly Barnhill: "Funny that you should say that. Because I was, just this morning, reading the early pages of a screenplay for this book. So Fox Animation has purchased the rights to this book and so all of those wheels are turning. And I don’t know where that’s gonna land or what’s gonna happen, but it’s been kind of interesting for me to be part of these conversations because movies – it’s a language I don’t speak. I’m not a visual thinker at all. At all. And so it’s difficult for me to even imagine what it would look like as a movie." Barnhill says, what she does know, is that the plan calls for a hybrid between live-action and animation. Kelly Barnhill: "… So, you know, the dragon would be animation and the swamp monster would be animated. But all of the human characters would all be played by human beings. And it would all be shot in the real world and stuff like that, which I think would be very, very cool. So I can’t say that I am even capable of imagining what it would look like as a movie, but I am really grateful that there are people who are thinking about that because it’s kind of neat for me to start to see the book through somebody else’s eyes. And that’s really fun for me. I’m having a fun time with it." And if the production company needs helpers to make a flock of paper birds for the movie, they won’t have to look any farther than Dover Elementary School. Special thanks to Dover Elementary School teacher/librarian Fiona Creed Chevalier. Find more episodes of Dorothy's List here.